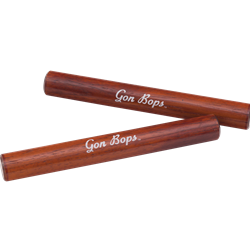 Hand crafted from hand-selected, high-density Hickory, new Gon Bops Hickory Claves offer piercing, high-pitched attack with a sonic profile almost identical to classic Rosewood claves. Crafted from sustainable Hickory – which is virtually identical in density to Rosewood – the new premium claves offer plenty of cut for both traditional Latin and modern musical styles. Both the clave and striker are 8.25” x 1” (209.5mm x 25.4 mm) in size.